While I would usually give a synopsis of a movie at the beginning of a review, the director himself has requested that we don’t write anything that may spoil Blade Runner 2049 for the viewer, so all I can really say is that Ryan Gosling earns his paycheck here, appearing in almost every scene in the film. That’s good news if you’re a Gosling fan. But of course he is only the young pretender in this sequel, and the star of the original movie, Harrison Ford, also features here, and while you do have to wait for his appearance, when he finally shows up it is worth it. Reprising his role as Rick Deckard from the first movie, he may be older and more grizzly, but he still radiates an exciting energy, and, as he proves in a full-on fight scene, he can still tear it up with the best of them. 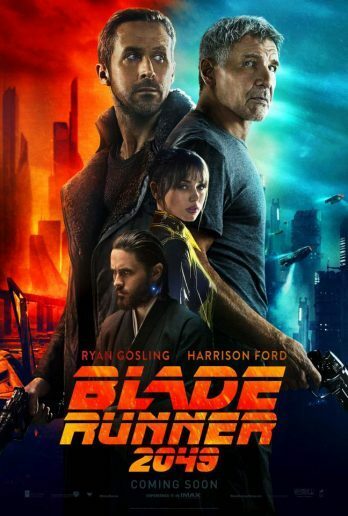 Without spoiling anything, I can tell you that this is set in 2049 – three decades after the original movie, and that Gosling plays K, a Blade Runner for the LAPD. IF you haven’t seen the first movie, their job is basically to ‘retire’ rogue replicants (synthetic humans that are bred as slaves). However, while going about his work, he uncovers a complicated long-buried secret, which could change the world as he knows it forever. Although Blade Runner 2049 uses the original movie as a catalyst for its story, it is not necessary to have seen it in order to be able to follow the plot. This expands on the world of the first film, but the effects are slicker and even more impressive. It doesn’t take too many chances, sticking to what they know the fans will enjoy, and their reverence for the original is obvious. It’s not reinventing the wheel in terms of genre, but it is more thoughtful than most sci-fi films, and is executed almost as a work of art rather than a movie. With a 2 hour 43 minute running time, it doesn’t rush to its conclusion, and while it could easily have been at least 20 minutes shorter without destroying the integrity of the movie, it never really feels as long as it is. Visually Blade Runner 2049 is stunning, and the sound editing is fantastic. If you can see this in IMAX then do, as you will really appreciate the audio-visual in that format. With a roll call of actors, such as those in the cast list, it goes without saying that the performances are great. Jared Leto is somewhat wasted, however, and his character never really gets a chance to go anywhere. The story isn’t overblown as sci-fi sagas sometimes have a tendency to be, and is extremely intelligent in its twists and turns. Even non sci-fi fans should find something to enjoy in Blade Runner 2049. It’s thoughtful and character-driven, and keeps you guessing until the end. A worthy sequel to the 1982 movie, this should satisfy old fans, and will definitely garner some new ones. If you fancy almost three hours of total escapism, then look no further.